A vigorous hybrid from Japan with bell-shaped dangling flowers borne in summer, and glossy tufted seed heads providing beauty for the rest of the season. A spectacular navy blue color that looks great paired with yellow-green or creamy variegated foliage. Vivid red orange daisy flowers with centers of gold grace this twining vine. The 2" wide flowers bloom from late spring to fall. Dark green, glossy leaves are toothed on the margins and are very handsome. Beautiful in a basket or on a trellis. This refined beauty of a vine was introduced from Mexico in 1833. The small heart-shaped toothed leaves are dark green with burgundy edges. 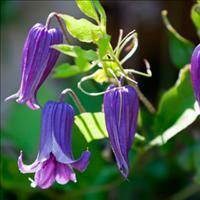 The violet bell-shaped flowers have a maroon "clapper", and the 2" flowers sway from the ends of thread-like stems. Try it in containers or twining up string trellises where it will bloom until late fall freezes. 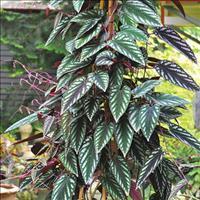 A tropical vine that climbs by tendrils, Rex Begonia Vine has heart-shaped leaves of deep green and burgundy dripping with silvery markings and flashing a wine red underside. Happy in a basket or trained on a trellis to 3’. Provide minimum temperatures of 60°F+, medium moisture freely draining soil and bright indirect light such as sun-dappled shade. A superb easy to grow, low maintenance plant. Picture copyright Margaret Roach.